What the hell is going on!? Where is the Donald Trump who berated Barack Hussein for his involvement in Syria? I have been on board with President Trump on nearly every issue, although I disagree with his socialized healthcare ideas. But, now our new President has really crapped the bed, attacking Assad in Syria. President TRUMP, do not attack Syria. There is no upside and tremendous downside. Save your “powder” for another (and more important) day. I believe President Trump’s attack on Syria is waaaaaaay wrong for a number of reasons. I believe the President has likely been fed faulty intelligence. By all appearances and from Russian reporting on the ground, Assad did not use chemical weapons on his own people. What he did do was bomb a terrorist chemical munitions depot, from which toxic gas escaped locally and resulted in the deaths of a couple dozen people. Where is the evidence that Assad was the culprit, maliciously attacking his own people for no conceivable reason? There is ZERO benefit for Assad doing this. It is illogical. It is a stupid premise. As any investigator should do, motive should be examined carefully. What possible motive could Assad have had to kill his own people? NONE! He was in the driver’s seat. He and Putin were clobbering ISIS, al-Qaeda, and other rebels. Peace talks were looming. Songbird McCain and Lindsey Graham are praising President Trump for this attack. That alone is reason enough to condemn it. They are both career parasites and consistently on the anti-American side of all issues. Assad is one of the good guys. Barack Hussein had us on the wrong side of this from the beginning, the ISIS side. Assad has been a secular leader, leading a multicultural nation where Jews, Christians, and Muslims coexisted peacefully. Assad protected the ancient Jewish and Christian communities in Syria. By all appearances, Assad is a westerner, not a foaming-at-the-mouth Islamic dictator. 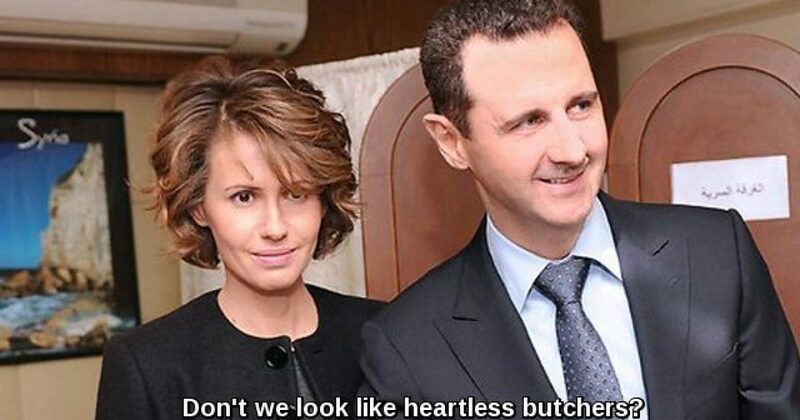 The photo, below, is Assad with his one and only wife. Notice the burka? Yeah, I didn’t think so. Both speak English fluently, are very well-educated and are much loved by the Syrian people. Don’t they look like ruthless butchers who enjoy killing children? Assad is not the brutal butcher some in the mainstream media are making him out to be.